Sign up for Broadjam today to follow busted.knuckles, and be notified when they upload new stuff or update their news! 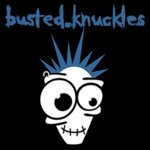 busted.knuckles is a hard rawking melodic skate punk band from Columbus, OH. The three piece group is headed by Zach Wahrer on guitar and lead vocals. Jeff Yost provides the low end on bass guitar, while Tomas Stolzfus rounds out the group on the drums and backing vocals. The trio has been together since 2001. Deep, insightful songs that are the characteristic trait that defines busted.knuckles. Feel the pain, cry and bleed, live your life, change for need. busted.knuckles is many visions, ideas, and hopes. But most of all, busted.knuckles is punk Not pop.